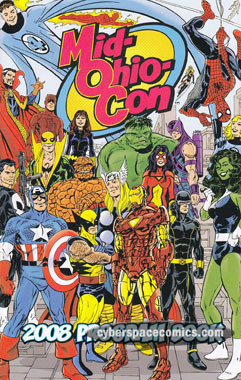 Many comic book conventions have informative program guides to let you know what’s going on there. And, oftentimes, larger conventions will hire professional comics artist to provide new artwork for the guide’s cover (and sometimes interiors). 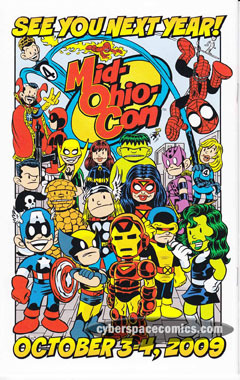 In this case, the Mid Ohio Con got John Byrne to draw a large group of Marvel super-heroes … and then got Chris Giarrusso to swipe the image in his very own ‘Mini-Marvels’ style.